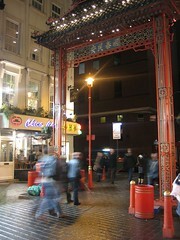 London's Chinatown is centred around Gerrard Street, in the City of Westminster. It is shared between W1 and WC2 postal districts. It's bordered on the north by Shaftesbury Avenue, on the west by Piccadilly Circus, on the south by Leicester Square and on the east by Charing Cross Road. The nearest Tube stations are Piccadilly Circus (on the Bakerloo and Piccadilly lines) to the west and Leicester Square (on Piccadilly Line and the Northern Line Charing Cross branch) to the east. Last edited 2019-02-07 12:55:09 (version 14; diff). List all versions. Page last edited 2019-02-07 12:55:09 (version 14).